Even in low-crime, largely white Bozeman, the fears and tensions of America’s fraught national debate over race and criminal justice — fueled by violent tragedy in places like Ferguson, Missouri, Cleveland and Dallas — hit home. The father, who declined to give his name after the event, told the police chief and attendees that he fears letting his son go to the store or head out alone for a run. When the child wants to shoot some hoops, he said, he feels like he has to park his truck nearby to watch over him. Even so, Crawford acknowledged earlier in the forum, in an age of 24-hour news and social media, Bozeman’s opinion of its police force is shaped, sometimes tangibly, by events on a national scale. 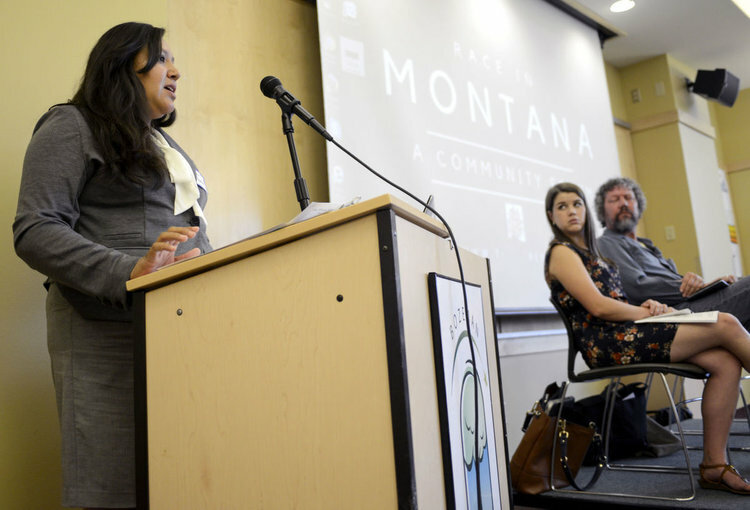 “We can’t just look at the fact that we have small numbers of people of color in Montana,” said Caitlin Borgmann, another panelist and the executive director of the state branch of the American Civil Liberties Union. Native Americans are incarcerated in the state’s prisons at a rate nearly four-and-a-half times that of white Montanans, and African Americans at six times the white rate, according to U.S. Census statistics cited by Borgmann. “It’s pretty alarming,” she said. Still, Borgmann said, there appears to be an opportunity politically at the moment to address criminal justice reform, both nationally and at a state level. “There is bipartisan recognition that it is insane how many people we put in, basically, cages, for ridiculous reasons,” she said. Event organizer Judith Heilman, also the racial equity project’s executive director, pointed to her experience in an earlier career as a black police officer working in Palo Alto, California, adjacent to Stanford University. Part of the problem, too, Heilman said, is that white neighbors will sometimes call police to report a black person walking down a street or sitting in a car, not because the black citizen is doing anything wrong but simply because the caller feels afraid. “We should not be responding to those calls,” she said, asking whether that would happen with the skin colors reversed.